Learn about the plight of the Monarch through Monarch Meet-Up, a new program designed to educate visitors about the declining population of monarch butterflies and challenge visitors to take ACTION in monarch conservation. 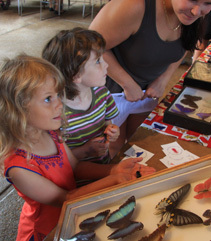 No cost to attend or participate, but there is a separate cost to enter Blooming Butterflies. Join us for a special day with representatives from local monarch conservation organizations! Interactive displays focused on monarch butterflies will highlight what you can do to help the population. Monarchs make one of the longest known insect migration on earth and everyone can make a difference in supporting their spectacular journey! There are various displays with information and activities about the monarch life cycle and migration. There will be an opportunity to make pollinator seed informational packets and a pollinator fortune teller game for kids! You can also purchase equipment for raising caterpillars. Be the first to see the live butterflies in the Bolz Conservatory during the second annual Member Preview Day at Olbrich's Blooming Butterflies! Olbrich members get an exclusive sneak peak of the exhibit one day before we open to the public. This preview event is open to Olbrich members only. To become a member, call 246-4724 or visit our Membership page for more information! Children can have fun while building their butterfly knowledge by traveling to four stations located throughout the outdoor gardens. While all of the stations will have fun facts about butterflies, only one of the stations will have a special password that the child can mark in the back of their activity booklet. Take the password back to the membership table outside the front entrance (or Greeter Desk after 4 p.m.) and receive a coupon for one free scoop of ice cream redeemable at any Chocolate Shoppe Ice Cream location! Butterfly Scavenger Hunt activity is only for children, and is available only with the purchase of a child ticket to Blooming Butterflies. 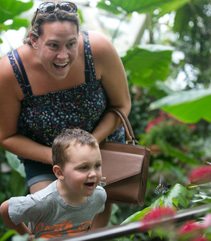 All visitors to Olbrich Botanical Gardens and Olbrich's Blooming Butterflies can be amazed by hundreds of exotic butterflies and insects from one of the most impressive displays of exotic insects in North America. 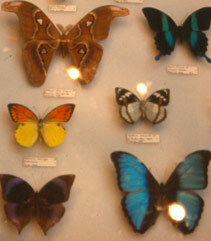 Dan Capps' collection ranges from butterflies to beetles to bees, and includes specimens from every continent. Meet collector's son, Jeff Capps, in person and talk to him about the amazing insect collection on Fridays from 2:30 to 4:30 p.m.
School groups, daycares, camps, bus tours, and other groups are welcome to visit Olbrich's Blooming Butterflies. We hope you will join us for this truly amazing event and register your group for a visit. Groups larger than 10 people must register in advance. Please contact the Education Registrar at 608-245-3648 or aschwoerer@cityofmadison.com to schedule a time for your group to visit so we can provide the best experience possible for your group as well as other visitors. Limited dates and times may be available for group visits. For adult groups visiting, one group leader will receive free admission into the exhibit. For youth groups visiting, one adult per every eight children will receive free admission into the exhibit, and any additional adults will be charged the regular admission pricing. Payment can be made on arrival with the Event Manager. Cash, check, debit or credit card (Visa, MasterCard or Discover) are accepted. Please do not bring carry-in food or drink into the building. Outdoor picnic areas are available nearby. Wheelchairs and motorized scooters are allowed in the Bolz Conservatory during Olbrich's Blooming Butterflies. For more information about Olbrich's wheelchairs and scooters available for use, please visit the Accessibility Page. For the enjoyment of all visitors, the use of strollers is discouraged inside the Conservatory. Stroller parking is available in the lobby.